On August 14, 2015, Kingston police charged a 51-year old woman with drunk driving when she crashed into a stopped vehicle at the intersection of Broadway and Albany. After striking the stopped vehicle, the woman’s vehicle crashed into a light pole. All four passengers in the stopped vehicle were taken to the hospital for minor to serious injuries. Kingston police are still investigating the incident and are considering additional charges against the driver. Rather than taking alternate transportation, finding a designated driver, or simply just not drinking and driving, a drunk driver chooses to risk the lives of others when she gets behind the wheel. These actions are otherwise known as negligence. When operating a vehicle, a driver owes a duty to the other drivers and pedestrians to use due care and not injure them or put them in harm’s way. Failure to act in accordance with this due care means that the driver is negligent. In this case, the driver was arguably negligent because she operated a vehicle while under the influence and due to her actions, she injured several people. Driving while under the influence of alcohol or drugs seriously impairs a driver’s ability to operate a vehicle. 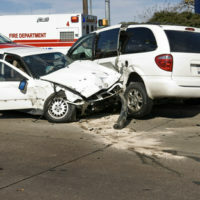 Negligence in an auto accident, including negligence as a result of drunk driving, makes you liable to the persons injured: both to their property and for any personal injuries sustained. Drunk driving is one of the most preventable causes of death in America. Drunk driving accidents tend to spike around the holidays. Due to this fact, the Ulster County Sheriff’s Department is participating in a program designed to curb drunk driving. “Stop – DWI Crackdown” is a statewide effort to “crack down” on drunk driving and begins this month through the Labor Day holiday. Although it is the driver’s responsibility not to drink and drive, there are some things that you can do to try and avoid drunk drivers. Unfortunately, drunk driving accidents happen. If you or a loved one has been injured as a result of a drunk driving accident, please contact our firm today to find out how the attorneys at Rusk, Wadlin, Heppner & Martuscello, LLP can help you.